The paper basically discusses the situation of McDonald’s in Australia. The industry size and trends have also been explored in the paper with respect to the local market of Australia. Along with this, the financial performance of McDonald’s is discussed which confirms the fact that it is doing reasonable in the industry. Furthermore, a SWOT analysis is also conducted which reflects upon the opportunities which are available for the company moving ahead in the future. The competitive advantages of McDonald’s in Australia have been explained in detail. Finally alternative solutions have been provided for the company which can further improve the overall performance of McDonald’s in Australia. The market size of fast food industry in the Australian market has been growing quite considerably. As per the research conducted in 2016, the revenue that is being collected by Australian fast food industry is $6.6 billion. This indicates that a large portion of revenue is collected from the fast food market and it is all set to grow and expand further with the introduction of more products that are liked and preferred by the customers in the market. Along with this, the fast food market is also a competitive one where it has been offering the consumers with wide range of goods and food items which makes it attractive for the customers. Furthermore, the industry will have addition of more foreign outlets coming over in the Australian market and will be competing. Therefore, it can be said that the size of the market is quite attractive which will further grow provided the quality of the products is consistent and prepared within the standards of healthy eating (Hebden, 2011). 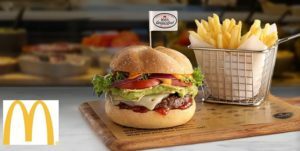 The trends in Australian fast food industry have been quite indifferent and people have been looking for alternative options to use while dining out. For instance, the diversification within the menus offered by different restaurants within the fast food industry has been changing quite significantly. This has resulted in changing the menu and expanding the core ingredients and also adding wide range of alternatives. For instance, chicken has been the major ingredient at KFC around the world. However, within the Australian market, KFC has introduced the Zinger Black Burger where the burger’s main ingredient has been pork. Moreover, other fast food retailers in the industry have also looked to make products that are specifically designed for the local market and they have been looking for diversity and different menus (Dunn, 2015). For instance, McDonald’s in Australia has looked to offer meat pies and rolls to its menu during 2016. The change has been inevitable and the consumers have become rather educated with the fact that fast food is something that is unhealthy and should not be eaten regular, therefore the trends within the industry has changed and customer preferences has changed too. The trends in the fast food industry of Australia suggest that the customer have become price sensitive also. This means the products offered in the industry at a higher price are not accepted by the consumers and they tend to focus on buying foods that are of lesser prices. This indicates the fact that the fast food industry in Australia has been shrinking and to make it a lucrative market once again, the players have to focus on quality and healthier products for the consumers (Fraser, 2010). None of the business is running without the profitability. Because the financial performance of the business is the important indicator which highlights that if the business is in the profit or it is facing the loss. If any investor wants to invest in the business look at the financial reports of the company. If the results are positive and he finds the potential in his investment he will prefer the stocks and shares of the company. It indicates that the how much important the financial growth is for any fast food company like McDonald’s. (Sidra & Attiya, 2013). According to the Statista the revenue of the McDonald’s is in decreasing trend on the global level. Because if we talk about U.S it was 8.85 USD billion dollars, 8.65 US billion Dollars, 8.56 US Billion Dollars, 8.25 US billion dollars, & 8 Billion dollars in years 2013, 2014, 2015, 2016 & 2017 respectively if we see the specific data of USA the overall revenue of the Fastfood company has decreased from 8.85 US billion dollars 8 billion dollars in 2017. If we talk about particular Australian Market the net income of the McDonalds Australia had been in USD million dollars 5,585 4,758 4,529 4,687 5,192 in year 2013, 2014, 2015, 2016 and 2017 respectively. This data is published on the morning star website a valid financial data website. These facts and figures of the McDonald’s Australia shows that in 2013 it has the good net income but after that it decreased to 4758 US million dollars in 2014 and now in 2017 it again has increased to 5192 US million dollars. There is not consistency in the revenue of McDonald Australia but the profits are fluctuating in this regard. The major strength for McDonald’s is the quality of products it offers to the customers. Furthermore, the presence of McDonald’s in more than 12 countries is also strength for the company. The strong brand name in the market has been considered as a major difference at McDonald’s. The constant innovation and addition in the product line is another more successful strength for the company (McColl-Kennedy 2010). The prices of products offered by McDonald’s as compared to other fast food restaurants are higher which a weakness for the company is. Moreover, the image of fast food as an unhealthy food item is a weakness which has affected the sales of McDonald’s. The employee turnover rate is quite high at McDonald’s which a weakness for the company (Dunn, 2015). The most obvious opportunity for McDonald’s moving ahead in the future for Australian market will be to introduce new products with the local taste. For instance, McArabia for Middle East market has been a successful induction, something similar for Australian customers can be a handy and lucrative opportunity. Along with this, another major opportunity for McDonald’s can be to reduce its prices and make it comparable with the local fast-food and international chains (Fraser, 2010). The major threats for McDonald’s come from the rival brands such as KFC, Subway, Hardees, etc. Along with this, the ever changing government rules and regulations is also a threat for the company. The increasing raw material cost is a threat for McDonald’s (Helms, 2010). The element of competitive advantage for McDonald’s has been its high quality products. The reason McDonald’s not only in Australia but it has been able to sustain its image and brand name by offering high quality fast food items across all parts of the world. The raw material used in the preparation of food at McDonald’s is considered to be of the highest quality which is why for a long period of time McDonald’s has been able to remain one of the top fast food brands in the world. The Australian market is no different and the company has been able to accumulate decent profits and revenues based on its performance which has led to increased revenues and sustainability in the market. Along with this, another major competitive advantage for McDonald’s has been its presence across Australia. From Canberra to Sydney from Perth to Melbourne, McDonald’s is everywhere. Therefore, the brand recall and recognition is also higher for McDonald’s as compared to other fast food chains in the country (Hebden, 2011). As we have researched the different variable related to the McDonalds Australia there are internal and external factors that affect the whole fast food industry including McDonalds. There are the possibilities and different alternative available to McDonalds which can help them to lead the Australian Fast food market. We recommend them to increase their annual profit by offering the different products and services to the customer which can unlock their potential. They should apply the different marketing strategies to attract more and more customer like Gamification technique is trending now days. Apart from that they can also exercise the available strategic options to lead the industry. Andrea, Z. B., & Silvia, V. (2014). What about Strategic Options? Lessons from Fiat’s Turnaround. International Journal of Business and Social Science . Scott, R. (2012). 4 strategies for McDonald’s management. Marketwatch.com. Sidra, M. A., & Attiya, J. (2013). Determinants of financial performance of a firm. Journal of Economics and International Finance , 43-52. Stephan, M. L., & Andreas, H. (2015). Measuring the profit impact of pricing & revenue management. Journal of Revenue and Pricing Management , 137-139. Hebden, L. A., King, L., Grunseit, A., Kelly, B., & Chapman, K. (2011). Advertising of fast food to children on Australian television: the impact of industry self-regulation. Med J Aust, 195(1), 20-4. Dunn, K. I., Mohr, P. B., Wilson, C. J., & Wittert, G. A. (2015). Beliefs about fast food in Australia: A qualitative analysis. Appetite, 51(2), 331-334. Fraser, L. K., Edwards, K. L., Cade, J., & Clarke, G. P. (2010). The geography of fast food outlets: a review. International journal of environmental research and public health, 7(5), 2290-2308. McColl-Kennedy, J. R., Yau, O. H., & Kiel, G. C. (2010). Marketing planning practices in Australia: A comparison across company types. Marketing Intelligence & Planning, 8(4), 21-29.